Pregnancy pillows are one of the coolest inventions on the planet, as far as I’m concerned! I used one for the last half of my pregnancy (over nine years ago!) and loved it so much, I’ve bought many more over the years. However, the pregnancy pillows on the market can be a bit costly, especially for the really good full body pillows. There are ways to make them, though, that won’t cost as much! I, personally, am not good with a sewing machine. It took me four years to learn how to thread it! Now, I can make awkwardly shaped somewhat-square pillows. That’s it. So I did what I usually do when I need help finding great tutorials- I turned to the internet to find out how to make your own pregnancy pillows. Take a look at what I think are the easiest instructions. Of course, if you find yourself getting frustrated, you can always give up and just buy one of our favorite pregnancy pillows! There are a few different types of pregnancy pillows out there, from basic tummy support to my favorite- the Snoogle. Before you embark on a journey to make your own pregnancy pillows, consider what type of sleeper you are. If you typically sleep on your back, chances are you’re not going to need a full body pillow like the Snoogle. I was a side-sleeper, so it was great for supporting my belly and placing between my knees to add more back support. I’ve chosen a variety of different types of pregnancy pillows, so pick the design that looks most comfortable to you! I think this one from Homemade Toast is my favorite, and not just because it’s gorgeous. It offers support to pretty much every essential part of your pregnant body. She even gives you a PDF pattern to help you get started, plus plenty of humor in her post! While this one will take a bit of time to pull together, it’s perfect for those of you who rock with a sewing machine. This one from The Maria Antoinette is similar to my beloved Snoogle but has boxier angles, making it easier to pull off I think. It’s great for those of you who prefer to sleep on your back but have to get used to sleeping on your side. Adriana Clark goes into great detail about the benefits of pregnancy pillows on her HubPages article before sharing her DIY tutorial for a more Snoogle-Like pillow. She even offers some great tips for beginning sewers. If you just want something to support your belly while you sleep on your back, this is as easy as DIY pregnancy pillows get. It’s also the most cost-effective, as all it really takes is a king-sized pillow. While this tutorial teaches you how to make your own Snoogle cover, you could easily just close off the cover, stuff it with fiberfill and voila, it’s actually a pillow itself! Or, follow the tutorial as is and make a gorgeous cover for your other homemade Snoogles. There you go! 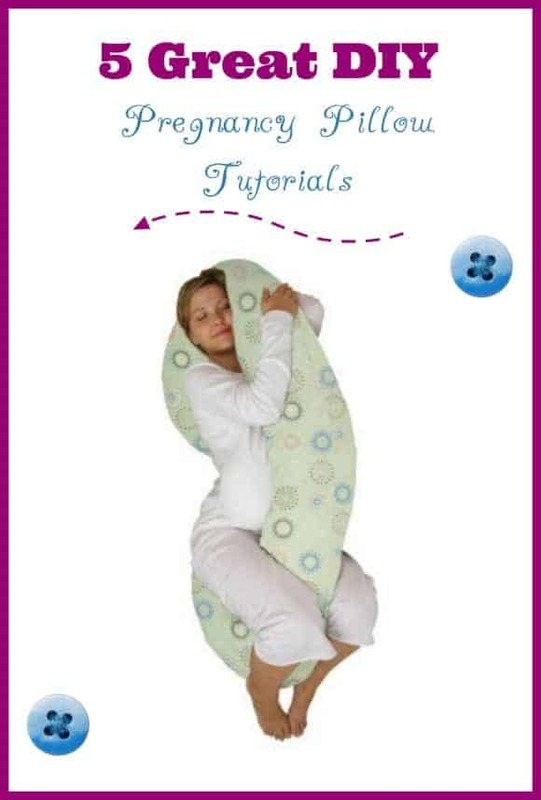 Five great tutorials on how to make your own pregnancy pillows. Choose your favorite, break out the sewing machine and sleep comfortably tonight! Which of the pregnancy pillows are your favorite? Tell us in the comments! good You can just give images from your gallery as breeze to your close friends only like a meaning, in your snapchat chat. This can be relatively a exceptional image writing software that enables	nice. I have a pillow like that, but my daughter stole it when she had spinal surgery and I was sleeping in her bed at the hospital (she’s only 2 and I was 37 weeks pregnant… no one was comfy). Special pillows are so important for pregnancy and nursing! Thank you for the pattern and tutorial. I really would like to make one of these pillows daughter-in-law, This is a perfect accompaniment baby shower gift to go with the fleece baby blanket that I made her. Had enough fabric left to make this pillow. i’m not pregnant and I want one of these. they look awesome. I love these ideas! I never had one that I found I liked, what worked for me was an old fluffy comforter. I could wrap it anyway I needed to depending on the night. This is pretty cool! I have a pillow like that, but my daughter stole it when she had spinal surgery and I was sleeping in her bed at the hospital (she’s only 2 and I was 37 weeks pregnant… no one was comfy). Special pillows are so important for pregnancy and nursing! Aww too bad I didn’t see this a few months ago. My SIL is preggo and she could have totally used this! She is so creative she could easily made these! What a great idea. Keeps the mind occupied too while pregnant! I’m with Cheryl above. I can’t find any way to get to these tutorials. I really would like to make one of these pillows for my daughter, daughter-in-law, and maybe one for myself. Help! This is an awesome post! My daughter is at the stage of her pregnancy where she is starting to think about pregnancy pillows. Thanks so much! This is such a great idea, and would make a great gift too! THIS IS A GREAT POST FOR ME TO COME ACROSS BEING JUST FOUND OUTIM 2 MONTHS ALONG! WISH ME LUCK! THANKS AGAIN! Looks comfortable, would be great for pregnant women. The simple support pillow would be good. That pillow looks comfy, great tutorial. My fave is the body pillow. Have to try the others though! now that is pretty neat.i will have to show a friend this. I do not see a tutorial . All I see are links to click that take you to price grabbers. I wish I had seen this tutorial when I was preggers, I really could have used this! Is It A Speech Delay or Autism?